Over the past few decades, the simulation game has become extremely popular both as a time-killer, and as a way to explore how the genre can be done differently. Good simulation games are like page-turners, you can’t stop playing because there is always something exciting to look forward to the next day in-game. I can safely say My Time at Portia not only ranks with Stardew Valley as a great simulation game, but it’s proved itself to be more than that. It’s a shack and it’s covered in holes through the floorboards, hardly “homey”. Harry Potter had better living conditions. As each simulation game has a different theme to them, My Time at Portia’s is focused more on running a workshop rather than something like a farm. At this workshop, given to you by your absent father, you can take on commissions from the Commerce Guild. These can range from something as simple as a wooden box, to requiring an entire civil cutter. Each creation requires different materials, which are then put together in a building process that may not be intuitive. For most creations, such as the ones made at the Workbench or furnace, all you need are the items located in your inventory, or even your storage box. However, the Assembly Station, which is for larger items such as civil cutters, furnaces, and grinders, have a different process. When you select the blueprint, you have to be holding one of the items required and then place it where it belongs. This process, while making it feel like you’re putting together something more grand, feels more clunky than anything else. Who needs an engineering degree when you have duct tape? In order to make anything, you first need to gather materials such as wood, animal bones, and ores. Wood, of course, can be found in trees and foliage, animal bones can be found in animals and creatures, and ores can be found in rocks and the ruins. These ruins have an entire gameplay mechanic of their own. Check out these sweet specs and my awesome jet-pack though. After spending a weekly fee to enter them, you can mine for relics or ores. In the Abandoned Ruins, there aren’t any hazards and you are able to teleport to the main entrance by going to your map and hitting E if you’re playing with mouse and keyboard. Another feature in the ruins is relic hunting. After hitting F, you can see yellow dots that can be locked onto. These can lead to rarer materials, or relics. These are items from a distant past that can be placed in your home or museum if you’ve completed them. The ones I’ve discovered have been toy soldier statues, “the thinking man,” leather sofas, and even a game controller. You may notice that these “relics” are common objects of today. Did I mention that My Time at Portia takes place in a post-apocalyptic Earth? Dude, it’s a DVD that contains instructions to make a blender. Despite its colorful appearance, My Time at Portia has a dark backstory hiding underneath the surface. According to the Church of Light, after “flying too close to the sun,” humans brought about their destruction, leaving behind the ruins you see in the current world. Not much is actually known about what happened, but the mystery encouraged me to keep pushing through story missions to learn more about this world and its inhabitants. This cute trio is known as the “Civil Corps.” They’re your typical town cops, but actually useful. Portia itself is a highlight of the game. In similar games such as Stardew Valley, I never quite felt like I was a part of the town, but rather a visitor. Here, it feels like all of these people are my neighbors, and they own have their own goals. Doing commissions for them, or just talking, builds up relationship points, and having your relationship with them adds perks such as gifts. I’m often asked to perform tasks for people in Portia, and sometimes they’ve led to new missions later on. Best of all, everything they’re asking for makes sense. The Research Lab may want old parts or old chips, the Civil Corps may need satchel that will help them survey the area, and businesses may need help repairing something. Even an old man that wanted stools only wanted them so he can sit down while he plays a game at the small park area. This quest involved making a boom box to chase Panbats away. The perfect solution. But, besides these subtle hints of character, the dialog from the characters themselves is limited. Rarely will they ever change up what they say if you select “chat,” even after a huge event happens or you beat them in a duel. You’ll usually receive new dialogue through seasonal events or if they have a new mission for you. I’d love for them to talk about their world a little more, or at least change up what they say every few days. Don’t think I’m above kicking a Civil Corps member in the back of the head. Each season is represented by a different month. Each month will have special events or holidays, some of which are based on the “old world” like Memorial Day, which has been replaced with Day of Memories with a celebration of those that have fallen rather than a somber day. These holidays often don’t have just one event. During the holiday is a moment of silence, followed by a scavenger hunt for ghosts around town, and finally, everyone sends ghost-like lanterns into the sky. It took all day and felt like a real holiday event. There are smaller events that happen during the month as well, such as two days of horseback racing, or two days of snowball fights. Fall features a horse race! The horses feel like a faster extension of your own body. My Time at Portia strives to give players plenty of things to do, and combat is one of them. Unfortunately, combat is one of the weakest points of the game. Clicking rapidly will allow the player to swing their weapon wildly at enemies, stunning them to prevent them from getting a hit in. But, it doesn’t feel good to attack an enemy, it feels clunky at times. To make matters worse, getting hit doesn’t provide a good enough feedback and you could easily be left with your health draining quickly, especially if you are surrounded by enemies in any of the Hazardous Ruins. These ruins always end with a boss, though these bosses are limited. The first set of ruins will only end with one boss, but ruins later on will have more. These bosses always follow the same pattern, and all of their attacks can be dodged with an invincible roll. Their battle theme seems to be the same as lesser enemies as well. You’d be much more intimidating if you didn’t drop out of “Boss Battle Music” school. While the music itself is beautiful, it can feel repetitive on a day to day basis. Seasons seem to only have two different themes, and they get tiring after a while, not matter how serene they may sound. It would have been nice to have different variations depending on weather or time of day, but the overworld is always the same from when you wake up to when you go to sleep. From my workshop, the world is quiet. It’s beautiful. 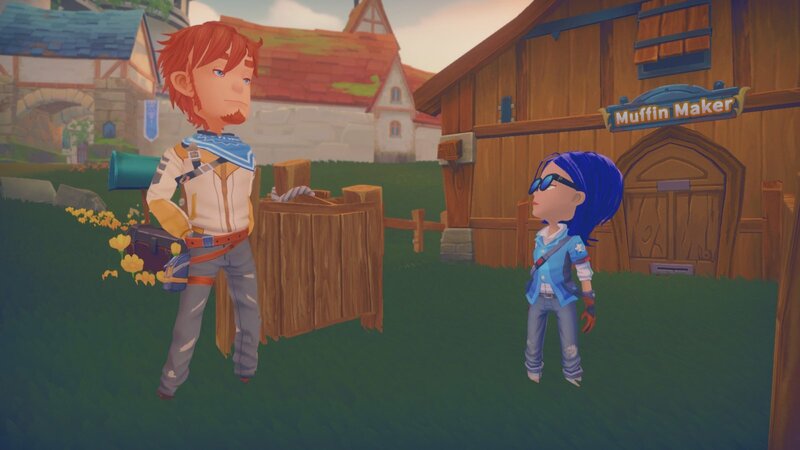 Unlike games like Stardew Valley, My Time at Portia opted to give a voice to most of its characters. Not every line is spoken, but a good number of them are including your main character. Unfortunately, the voice acting is often awkward, and the sound itself is too quiet even if everything else has been turned down the lowest they can be without being muted. Some of the words don’t even match with what’s on the screen, which happens rarely, but it’s still a distraction. You are technically correct, but I’m going to need you to speak up. There may be some players that grow tired of waiting for their items to be crafted as it can take hours for one bar of Carbon Steel Bar to be made and even longer for other materials. Fortunately, there was plenty for me to do where I never felt like I was only waiting around for everything to be done originally. I’d set up things to craft in the morning and run around town to find missions, mine for ore, or enter the Hazardous Ruins. There was so much for me to do, I started to worry that I was wasting my time by not doing something that gained me materials. Since time doesn’t progress in dungeons, I’m going to take all the time I want on my way to punch that mouse in the snout. As time progressed, this seemed to slow down. Materials took longer to make and the excitement of new areas and missions calmed down until I would unlock access to a new area. Eventually, I had to learn to make more furnaces or civil cutters to be more efficient just to complete all of my commissions on time. And of course, these commissions were the best way for me to have a hope of upgrading anything in my house. But, when I’m spending so much time waiting for the later-game materials to be created, I grew sick of mining and chopping down trees. Some of these creations were blocking me from accessing new areas and it’s here where I felt like the game slogged. I could waste time taking selfies of all of my new friends, which is definitely a perk of building up relationship levels. Despite these moments of standstill, there’s so much to do in My Time at Portia that I’m worried that I haven’t covered it all. You can dye almost all pieces of furniture to set a theme in your home, you can have a farm with animals to get milk and eggs from, it can take 70+ hours just to reach the end of the story (yes, there is a definite ending now), and you can marry the majority of residents in Portia. For the majority of my time in this colorful post-apocalyptic world, it was primarily a great experience. My Time at Portia is not just a simulator, it’s an adventure game loaded with things to do, people to talk to (and potentially romance), ruins to explore, and things to create. It’s an addicting romp that keeps you playing the next day in hopes of finally completing that one goal only to create another one in the process.